San Diego Fence Provides Lessons in Border Control As Congress looks to revamp immigration policy, some lawmakers are pushing to extend fencing along the U.S. border with Mexico. They already have a model they can look to: a 14-mile-fence built in the 1990s to separate Tijuana, Mexico, from San Diego, Calif.
A Mexican couple hugs in front of the Mexican side of the 14-mile-long fence that separates Tijuana from San Diego, visible in the background. The U.S. House has voted to create a barrier fence along 700 miles of the U.S. border with Mexico. Supporters say the fencing will bolster national security and curb illegal immigration. Opponents decry it as a new "Berlin Wall." NPR's Ted Robbins helps explain the proposal and existing border barriers. 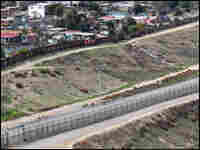 An overhead view of the double- and triple-fencing used in the 14-mile-long border fence separating San Diego and Tijuana. In the enlarged image, a Tijuana neighborhood is visible at left. The open field at right is in California. As Congress looks to revamp immigration policy, some lawmakers are pushing to extend fencing along the U.S. border with Mexico. Proposals range from beefing up existing fences in Arizona to constructing new fences that would span 700 miles. Those advocating expanded fencing already have a model they can look to: a fence the federal government built more than a decade ago along a 14-mile-stretch in San Diego, Calif., that borders Tijuana, Mexico. 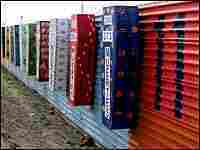 To those on the U.S. side, the fences in urban areas between Mexico and the United States are a symbol of security. Very few sections are painted or adorned in any way. To many Mexicans, though, the fence is either an insult to be covered up, or a business opportunity. In Nogales, Sonora, shopkeepers say they are offended that the United States built a wall between them and their twin city, Nogales, Ariz. In Tijuana, long stretches of the fence are covered in advertisements or posters. Another section has crosses and coffins nailed to it, in memory of those who died trying to immigrate. 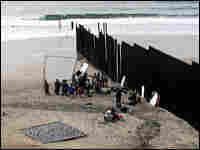 And at Imperial Beach, which is split at the border by giant steel pillars sunk into the sand, a movie crew shoots what is billed as a “Spanish-language, science-fiction love story” with the fence as a backdrop... immigration politics as entertainment. 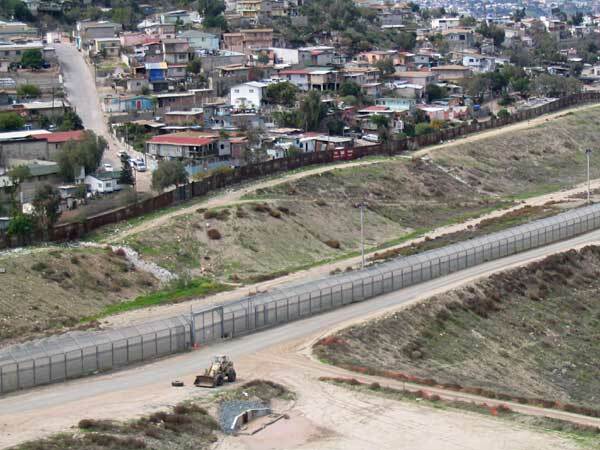 Before the fence was built, all that separated that stretch of Mexico from California was a single strand of cable that demarcated the international border. "It was an area that was out of control," Henry says. "There were over 100,000 aliens crossing through this area a year." Today, Henry is assistant chief of the Border Patrol's San Diego sector. He says apprehensions here are down 95 percent, from 100,000 a year to 5,000 a year, largely because the single strand of cable marking the border was replaced by double -- and in some places, triple -- fencing. The first fence, 10 feet high, is made of welded metal panels. The second fence, 15 feet high, consists of steel mesh, and the top is angled inward to make it harder to climb over. Finally, in high-traffic areas, there's also a smaller chain-link fence. In between the two main fences is 150 feet of "no man's land," an area that the Border Patrol sweeps with flood lights and trucks, and soon, surveillance cameras. "Here in San Diego, we have proven that the border infrastructure system does indeed work," Henry says. "It is highly effective." Rancher Carol Kimsey, who lives in a valley near the Pacific Ocean on the U.S.-side of the fence, says the border barrier has improved the quality of life in the area. "It was pretty seriously bad," she recalls of the prefence days. "They were tearing up everything. They'd just go through fences. They didn't care." Kimsey says life is more peaceful now, despite the Border Patrol helicopters circling nearby. This is still an active smuggling route, especially for drugs. A stretch of border where there's only one fence is referred to as Smugglers' Gulch. The Border Patrol is moving forward with plans to add a second fence there as well as along the last 3.5 miles to the ocean, which had been held up by years of litigation over environmental concerns. The extra fencing will cost at least $35 million. But Claudio Smith, an attorney and border activist, says the toll has been much higher in human lives. She says the fencing has simply forced immigrants to take more dangerous routes through the mountains and scorching-hot deserts. "It didn't stop people from crossing," she says. "It just forced them to cross in the deadliest stretches of the border." An estimated 3,600 people have died crossing the U.S. border since the fences went up. It is now harder to cross the border into the United States, and also more expensive. Border crossers say they pay human smugglers, or coyotes, much more than they did a decade ago. Smith says the fence has actually created a sort of perverse and unintended consequence: It is keeping people in the United States who used to go back to Mexico. "The men would come for a number of months out of every year and return (to Mexico)," Smith says. "Now, not only are the men staying, but they're bringing their families." During the last decade, millions of people have continued to cross the border illegally -- mostly in Arizona. That's the next target for those who want to build double- and triple-fencing.